Are you looking for a shutter solution that provides exceptional strength and flexibility? Our industrial steel roller shutters are perfect for catering to the unique needs of large complexes and facilities, providing an extra touch of security and functionality to any openings and entrances. Our steel roller shutters offer superior strength and resistance thanks to the use of wind-lock clips and guides. An innovative mixture of features makes this product a popular and reliable choice. Steel-Line supplies SC100 roll-formed roller shutters constructed with 100mm galvanised steel slats for added durability. The heavy-duty design of the steel slats allows them to endure the often-tough conditions of industrial/commercial environments while requiring minimal maintenance. If damage does eventually occur, the affected slat can be replaced individually. The SC100 steel roller shutter features a guide channel with nylon rubber to minimise noise during opening and closing. This keeps movement smooth and non-disruptive throughout the product’s lifetime. This roller shutter can be manually or electronically operated for your convenience. Whether you require maximum security for your warehouse, workshop or commercial building, our steel roller shutters are an ideal option. They can be manufactured to fit almost any size and space. We give you the choice of having your steel roller shutters installed with either a smooth manual or convenient power operation. No matter what your preference is, we have the option to accommodate your needs. Our steel roller shutters are guaranteed to be a long-lasting investment for your organisation. Made from the sturdiest materials, your product will withstand the elements, resisting corrosion and maintaining its exterior for years to come. The sleek and modern appearance of these shutters makes them perfect for any industrial building. Their simple yet contemporary aesthetic allows them to easily suit any existing architecture and style, creating a seamless overall appearance for your exterior. 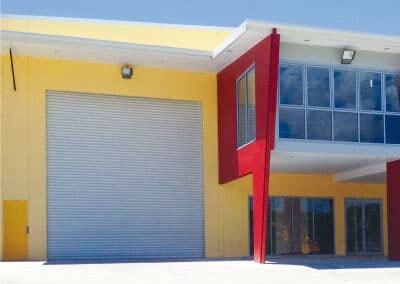 When you need roller shutters for your new or existing building, turn to the company that has been serving Australians in this industry for more than 30 years. A Steel-Line door is one of the best investments you can make for your commercial or industrial premises – contact us today to discuss your requirements.